What Are The Odds That Duke, Not Kentucky, Is The Last Unbeaten? A staple of early January college hoops coverage is speculating whether any of the remaining unbeaten teams can finish the regular season without losing. The correct answer is always "probably not", but over time a team like a Wichita State or Saint Joseph's will make you regret your "probably not" and turn you and your heartless, calculating soul into a dreamer. This year may provide another perfect regular season with Kentucky making a case for being the best college team in at least a decade. This has been discussed exhaustively if you followed the game's news cycle. But one issue yet to be addressed is the chance that each of the three teams yet to lose — Kentucky, Duke and Virginia — end up being the last remaining unbeaten. To determine this, I simulated the remainder of the regular season a million times using my current ratings. In doing so, we can break down various scenarios and get a realistic idea of what's in store for the three teams chasing the elusive goal of perfection. So let's look at each program's chance of being the last unbeaten this season, along with various other fun facts. 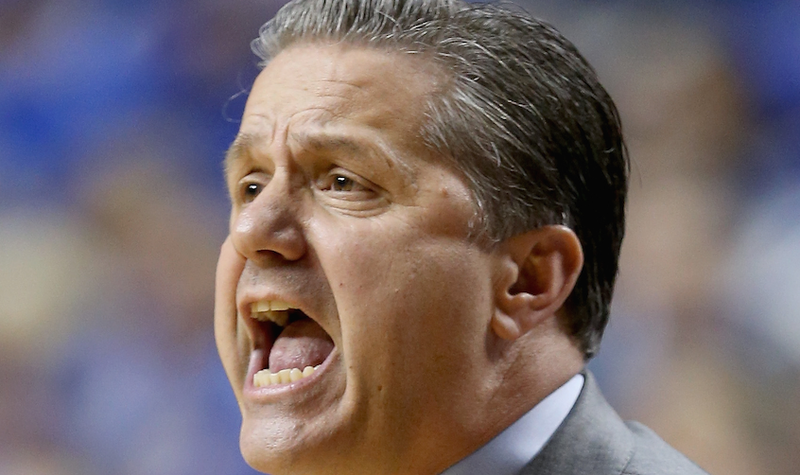 It's no surprise that Kentucky is the most likely team to be the last unbeaten. In addition to being the best of the three undefeated teams, they also face the weakest remaining schedule by virtue of playing in the SEC. At one time, Florida was considered a top ten team but they've struggled early in the season and a game in Gainesville doesn't appear so daunting these days. The Gators have already suffered home losses to Miami and UConn, neither of whom has looked terrific early in the season. The schedule isn't all rosy for Kentucky, however. South Carolina and Georgia have played surprisingly well and the Wildcats have to play each team twice. Still, the Gamecocks and Bulldogs are rated as the third- and fifth-best squads, respectively, in the SEC by my system. In the ACC, Louisville ranks third and Notre Dame ranks fifth. So relative to their fellow unbeatens, the Wildcats have a significantly friendlier conference slate. It may be a surprise that, at 17 percent, the most likely game to do them in is a January 24th contest at South Carolina. This is not their most difficult game. At the present time, that honor still belongs to the tilt at Florida on February 7. But the Wildcats are more likely to make it to Columbia unbeaten, so at the current time if you had to pick one game to be UK's first loss, that would be the intelligent choice. The average date of the Wildcats' first loss in these simulations is January 30. Finally, it should be noted that my system is less optimistic about the Cats' unbeaten chances than the betting markets. My system gives them an 18 percent chance of finishing the regular season without a loss, while odds posted at Bovada earlier in the week implied chances in the high 30's. But the extremely close call against Mississippi last night should put into some perspective how difficult it will be for Kentucky to run the SEC table. Currently, my system has UVa rated better than Duke and I'll admit that I've been hotly debating this with my computer for the past few days. At some point Justin Anderson's 59 percent clip from three-point range will feel the gravitational pull of reality and then the Cavaliers' offense might slip from its current outstanding level to merely being just very good. Regardless of where you stand on this issue, the Hoos have the easier schedule going forward, especially for the next month, and are the favorite to outlast Duke in the unbeaten club. Looking farther down the road, Virginia's game with the Blue Devils on January 31 is conveniently in Charlottesville while the toughest game on the Cavaliers' schedule, at Louisville, is the season finale and very unlikely to come into play. Just five percent of the time does the Louisville game end up being UVa's first loss. The single most likely first defeat is actually Saturday's game at Notre Dame, which occurred in 27 percent of the simulations. This is easily the most difficult game before the showdown with Duke. The two other road games that the Cavaliers play during that time are against Boston College and Virginia Tech, possibly the two worst teams in a league with a surprising amount of dead weight. Virginia is unlikely to make it to February unscathed. The average date of its first loss is January 27. In the short team, Duke's biggest roadblock to remaining unbeaten is a January 17 game at Louisville. There's a 35 percent chance that the Cardinals are the team that knocks off the Blue Devils first. By the way, the Cards are a common thread to all of these teams. By the time the ACC tournament concludes, Rick Pitino's team will have played at least four, and possibly as many as six games against these squads. The Cardinals whiffed at ending Kentucky's run in a 58-50 loss on December 27, but chances are they'll get a shot at spoiling the Blue Devils' perfect season. The second-most likely game to trip up Duke is Sunday's contest against N.C. State. It's not nearly as difficult a test as later games at UVa and the season finale at North Carolina, but it's unlikely Duke makes it that far into its schedule with its unbeaten record in tact. While it's tantalizing to begin hyping the Virginia game as the rare late-season matchup of unbeatens, it almost certainly won't go down that way. In addition to the roadies with the Wolfpack and Cardinals, Duke also has to survive games at Wake Forest, St. John's and Notre Dame before then. There's just an 11 percent chance of both Duke and Virginia being unbeaten when they meet and there's a 34 percent chance both have a loss by that point. Overall, there's a 25 percent chance that at least one of the three unbeatens makes it to its conference tournament without a loss and a 1.5 percent chance that two teams accomplish this. Even with as good as Kentucky appears to be, odds are we won't be talking about perfection when the NCAA tournament begins. Ken Pomeroy is the founder of KenPom.com, the best site for advanced analysis of college basketball. He's written for ESPN.com, Sports Illustrated, and The New York Times. How Has The NCAA&apos;s New 30-Sec Shot Clock Worked This Postseason? Is A No. 11 Seed Actually Among The Best Teams In The Country?